After a rest day self imposed ( I did not do Col de Mandeline on 16 July 2015 ) I enjoyed a car ride up the Mountain and coffee and an apple tart and great views of the French Alps and Mont Blanc in the distance. It was then a 4 plus hour drive to Malaucene , a town at the foot of the climb . We settled in and had a lovely dinner at the Hotel Blueberry where we are staying .Nice rooms but with the hot weather and no fans , the room we are in is warm. We climb Mont Ventoux on Friday morning the 17 July 2015 . It is lengendary for cyclist because of the Tom Simpson story and the role it has played in TDF races over the years. I am looking forward to the climb and hopefully the rest day helps. Colin Lewis remembers his teammate Tom Simpson on the anniversary of his death from cyclingtips on Vimeo. 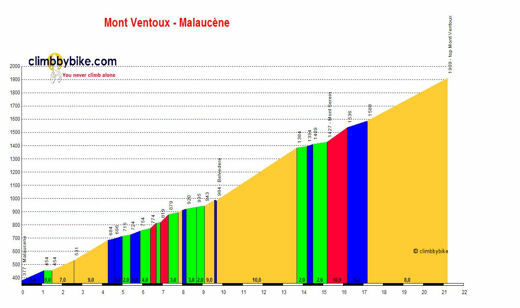 It is a highlight of the tour and a very daunting climb with the gradient on the climb averaging 7.9% and many kms at 10% .There is also the high winds at the top and the name Ventoux is thought to come form the word Venteux which means windy in French. The winds average 90kph 240 days of the year and has recorded the highest wind speed of 320Kph. We set off after breakfast and headed to a small village called Biacon and after pictures headed for the climb up Mont Ventoux , a 21 km climb .It was slow going and I estimate I took over 2 and a quarter hours to climb it stopping for water and the Tom Simpson memorial. Whilst slow I did find the ride bearable even with some high gradients of 10%. There were many cyclist on the road to Ventoux and it was a great experience to have done it .As all climbs it was slow going but I managed to keep a steady pace up and not have too many breaks . istopped at about the 20km mark and had some water from the support car Kim was driving and again 6 kms from the stop at a café . I did take pictures at the Bob Simpson memorial about 1.5 km from the top. I averaged just over 15kph with the downhill leg and I think I took about 2.15 to 2.20 to climb to the top. Whilst tiring it wasn't as tough as the Col de L'Iseran which I found very tough. The weather helped with it not being too hot and windy.